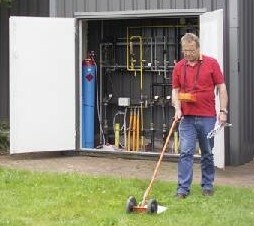 This system is used for locating water leaks and refrigerant gas leaks. The leaking system is filled with the gas and the escaping gas is located with a highly sensitive computer. The mix of gas is 95% Nitrogen and 5% hydrogen. Hydrogen will pass through any material; concrete, tiles, ground, due to it being the smallest molecule. This environmentally friendly gas mixture is neither combustible, toxic nor corrosive.